I'd rather be reading Inside by Brenda Novak then sitting here at work waiting for something to do (especially since they started blocking websites at work). 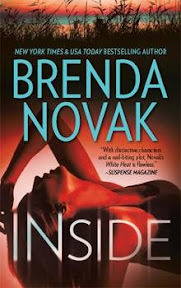 Inside is scheduled to release June 21, 2011, but I got an advance copy from NetGalley. I had a chance to read a few chapters this past weekend, and so far the story is really pulling me in. This looks to be a compelling contemporary suspense novel. Just a heads up though - it was a bit confusing at the beginning of the story because Virgil is using an alias when he's first introduced. So, from page one I was trying to figure out if the blurb had the wrong name or if the character I thought was to be Virgil was actually someone else. It becomes clearer as the heroine discovers more about Virgil and the situation, but it did have me puzzled with the storyline for a moment. Virgil Skinner served fourteen years for a murder he didn't commit. He's finally been exonerated, but he can't escape the gang he joined in order to survive. They'll do anything to keep him from telling what he knows. And if they can't get to Virgil they'll go after his sister and her kids. The California Department of Corrections needs someone to infiltrate another gang, one that's taking control of the state's most notorious supermax. Virgil's the perfect candidate - and he'll do it in exchange for his sister's protection. Assistant deputy warden Peyton Adams is opposed to having Virgil in her prison. How will she protect him if things go bad? Besides, she's attracted to him; she might even be falling in love with him. That makes her all the more desperate to keep him safe - and it gives him someone else to lose. Very nice blog. New Follower. Like the organization very much. Thanks for the compliment and follow, Grace!